This Banana Buttermilk Chocolate Cake is the kind of classic cake that never goes out of style. It’s the kind of cake that you can bring to bake sales or barbecues, and even serve at dressy dinner parties. It is also very easy to make, so it’s the type of recipe that you can keep “in your back pocket” for occasions when you need a cake quickly. In short, it is an all purpose cake recipe and it is absolutely delicious. Bananas and chocolate share the flavor spotlight in the cake. There are very generous amounts of both mashed banana and cocoa powder in the cake batter, and they contribute to a cake that is extremely moist and has a very tight, tender crumb to it. There are subtle butter and vanilla undertones here, but chocolate and banana are the stars. The cake is very satisfying, but it is not to rich or heavy, so you can eat a generous slice without feeling stuffed, too. 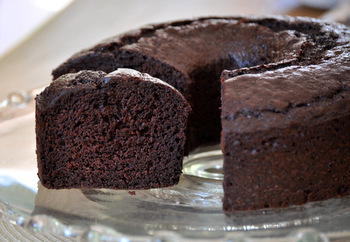 I baked this cake in a 10-inch ring pan, but it can also be baked in a bundt pan. The baking time will be about the same, but don’t forget to grease and flour your bundt pan to ensure that the cake comes out cleanly. You can serve it plain, or top it off with a drizzle of chocolate or cream cheese frosting. You can even turn it into a sundae with a scoop of vanilla ice cream. The cake keeps well for several days when stored in an airtight container, and you can even freeze a few (unfrosted) slices to save for another day. In a medium bowl, sift together the flour, cocoa powder, baking powder, baking soda and salt. In a large bowl, cream together butter and sugar until light. Beat in the eggs one by one, waiting until each has been incorporated to add the next. Beat in vanilla extract and mashed bananas. Add half of the flour mixture to the butter mix and stir to combine. Add in the buttermilk, followed by the remaining flour mixture. Bake for 50-55 minutes, or until a toothpick inserted into the center of the cake comes out clean and the top springs back when lightly pressed. 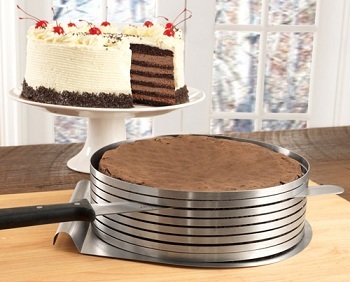 Allow cake to cool completely in the pan, then run a knife around the edges of the pan, turn cake outÂ and reinvert onto a serving platter. any recommendations on buying a tube pan that is one piece or the type that has the removable bottom? I’m afraid that the batter could leak from the 2 piece pan. But after baking, removal from the 2 piece seems easier. The cake cooks fast (atleast for me) I took it out 10 mins early but I think it could have been taken out about 5-10 mins earlier than that. This was pretty good, a nice balance of chocolate and banana.